NPC Baymu in Tomun range wears it but also some others. 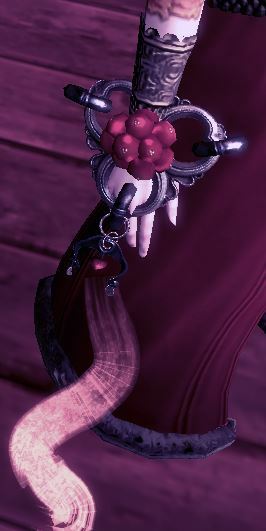 I have searched in https://bns.mmo-fashion.com/weapons-bangle/ but I can't see it. Check the Faction Merchants in the desert. I know one of them sells this one in white color + green tail which i am using on my FM and i am pretty sure he sold another one in red. Im in the Crimsion Faction if that matters.